SEO pitches seem to all be the same. Lots of over promises and things that seem to be too good to be true. There are a lot of shady SEO agencies out there just looking to make the quick buck, so I decided to share the top things you should be asking when considering outsourcing your SEO to another company. Here are some of the most important things one should ask when thinking of hiring an SEO. Be on a lookout for people who don’t give a definite answer to this. Either the person is incredibly vague on the strategy, or they just decide to talk for a long time and never honestly answer the question. Even though I don’t know much about direct mail marketing, I should be able to follow the logic of a plan. Here is an example of how I answered a question that I got from a potential client. The first step is that we have to understand what Google and Bing already look at when they come to the site. 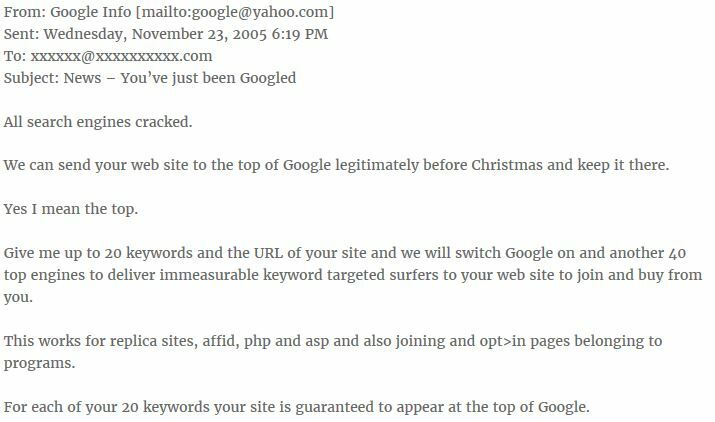 I am going to ask for the last month of your log files (you can ask your webmaster for this), and I am going to analyze what Google and Bing crawl and index. Keyword research will be our next step after the log files analysis. Making sure that we are going after the right terms is vital regarding ranks and qualified traffic visits. The way I am going to do this is with a few third-party tools to get an idea of a 12-month traffic pattern that includes seasonality. With the research completed, we will begin the optimization by changing a few title tags and immediately flagging them for Google and Bing to crawl. We will be able to see if Google and Bing are crawling these pages based on next month’s log files. In the meantime, I will be running daily keyword ranking reports and wrapping them up as weekly averages. Chances are you will talk to someone who claims they are an expert in the field. It’s not to say that you should know their name before the call, but you should run a search to see what comes up. Are they active in social? Do they have a personal website? Do pictures show up for their name? Is there any lousy content out there that says that this person is running a scam operation. These are all things you can look up in a flash just by performing a quick search. People leave jobs all the time. That’s not the issue though. The problem is when you have no idea that the person you talk to left and nobody got reassigned to your account. Having consistent check-ins with the contractor is an excellent first step in making sure there is communication. The next tip is when you are on the sales call is to flatly find out who will be working on the account and get that in writing. Chances are the manager will be on the call to close the deal, but they won’t work on the report. This then will confuse the client since it could very well be an intern who is doing all the work without the manager even involved. Always get this answer when it comes to talking with companies. This example above is pretty wild when it comes to pitches. So many issues here it’s rather hard to take this seriously. 100 dollars a month just seems so crazy that you will need to think what this would get me. I also did not mention that the account manager has two awkward Bitly links under their name. No idea what this is about, so better not click on that. Another red flag that stands out in this picture is that Bing AdWords does not exist. 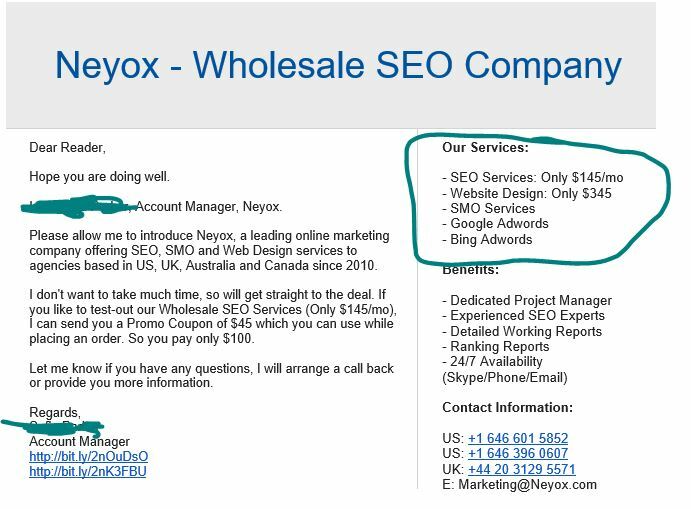 Here is an example of what spam SEO emails look like. Here is the link to this source if you want to learn more about this. SEO is the long game when it comes to digital marketing. There are so many Google updates, changes in the SERP, updates on what markup you can and can’t use, and more that you need someone who is consistently on top of these updates. The idea that someone can somehow crack a search engine already sounds very suspicious. If you only look at keyword rankings as the only success, then you are missing out on all aspects of SEO. First, I think of the goal of what I am trying to do. The chances are that driving more traffic to the site and increasing sales is the primary goal. 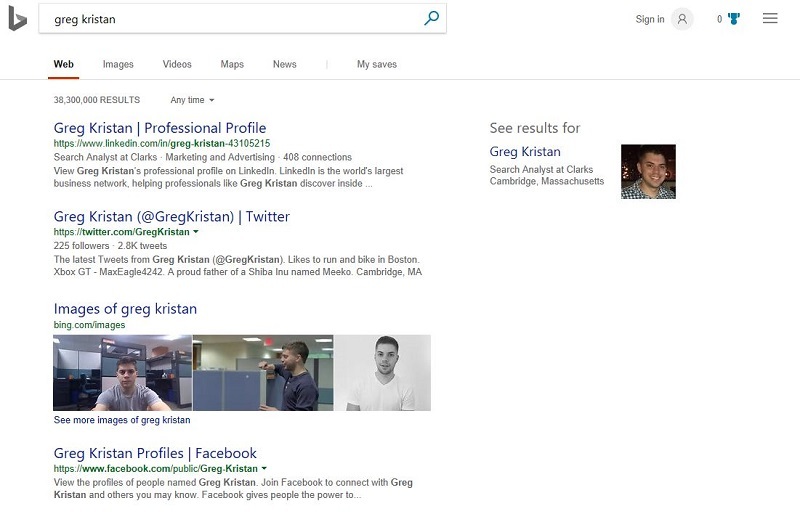 That picture above was from a technical fix that I worked on with Bing. 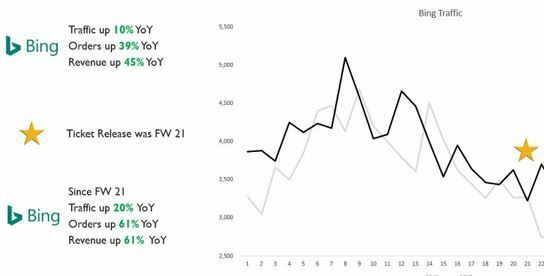 I was able to chart out the Year over Year traffic to get a baseline of the traffic from before and after the fix. The gold star represented when the fix went into practice and the results that came out of it. A clear example like this can let the client know that your success comes from measurable KPI’s like this. Conversations are going to be pretty frequent with an SEO. If you are not hearing from your contractor, you should be emailing them to see what is up. Ask for a regular check-in like once or month just to see how everything is going. Request a screen share meeting if possible to look at the results. Having this type of transparency will create better engagement from the team and more trust into the system. Sometimes the contract did not work on which happens. To protect yourself, you should ask what happens if this becomes the case. Most likely a company will say that everything will transition over to the new team without a problem. You should get this part in writing in your contract to protect yourself. I’ve seen a few companies get burned by a former agency which already delayed our strategy. Things like deleting all the PPC keywords, blocking robots from viewing a site, redirecting a domain to a shady place, and much more. Always stay protected because you never know what could happen with some of these palaces. These are some of the things that I hope people will begin to ask search professionals when they think of having this service contracted out. Some of these questions overlap with each other, so it’s best to see what is most important to your business. If you are looking for Boston SEO, I offer them with transparency as a key part to my life style. If you have any questions about my work, you can check out my regularly updated SEO case study section.